Sonic and friends get the CGi treatment in Sonic Boom. Sonic the Hedgehog is coming back to TV, folks. Sega announced that their most popular character will star in a new CG-animated series, Sonic Boom next fall. Co-producers SEGA of America and Genao Productions will produce 52 eleven-minute episodes for the series initial run, which will air on Cartoon Network in the US, as well as Canal J and Gulli in France. Believe it or not, Boom will be Sonic's fifth TV series in the last twenty years. 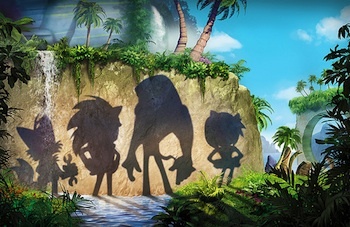 Described as a "character-driven comedy," Sonic Boom will follow the exploits of Sonic, Tails, Knuckles and Amy, as they "search for adventure" and square off against Dr. Eggman and other villains. "Sonic is the star of the SEGA universe and the stage is now set for him to shine like never before. By teaming up with world-class partners in television animation like Cartoon Network, Genao Productions and GULLI, we're ensuring that the Sonic legacy will be introduced to a new generation of children across the globe," said Sonic Chief Content Officer Hiroyuki Miyazaki.